Crickets can be purchased live from pet stores or online from insect suppliers. Live crickets should be “gut loaded.” The food the cricket has eaten (in its gut) is also beneficial to your hedgehog. Gut loaded crickets have more vitamins, minerals, calcium, and nutrition than a cricket that hasn’t been fed properly. Live crickets can be pre-killed or stunned by placing them in the freezer for hedgehogs that have not had the experience of hunting crickets or who are not adept at hunting crickets. Crickets left in the freezer for only a short amount of time will revive, so if you are intending to kill them they should be left in the freezer overnight. 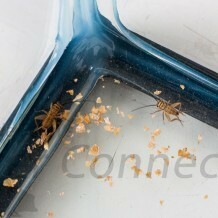 Crickets should be maintained in a large aquarium with a screen or mesh lid or other specialized container. Cardboard egg crates provide hiding places and keep the crickets from trampling each other. They should be fed a high-calcium cricket food and water should be provided via carrots, sweet potatoes, a moist sponge on a shallow dish, or specialized cricket gel. Freeze dried crickets are brittle and should be stored in plastic containers to prevent crumbling. Earthworms carry lungworm or threadworm, which can be transmitted to your hedgehog and is fatal. Mealworms have a three-stage life cycle: larvae, pupae, and beetle. The mealworms that you buy are in the larval stage of mealworm development, but all the stages are edible to hedgehogs. It is fairly easy to raise your own mealworm colony at home if you have the time and a little extra space. A mealworm colony needs normal/warm room temperature and simple food requirements. Several Internet sites are devoted to raising mealworms as feeders. Feeder mealworms should be kept in the refrigerator and maintained on a high calcium insect food as bedding. Mealworms will turn into beetles if they are not kept in the refrigerator. The Black Solider Fly Larvae has several different names of the same species depending on how they are raised and what they are fed. Reptiworms™, Phoenix Worms® and Calciworms® are all the same species of the Black Solider Fly Larvae (Hermetia illucens). The worms naturally start turning brown/black as they are preparing to change into a fly. This is actually when they have the most calcium. They can still be fed when they turn brown/black and can be fed even when they turn into a fly. ReptiWorms™ are not typically found in pet stores and need to be ordered online. ReptiWorms™ are naturally high in calcium and low in fat. No noise and low odor. They have an ideal 1.43:1 Calcium: Phosphorus ratio (Ca:P). The Ca:P range of 1:1 to 2:1 as recommended by the herp community. They are low maintenance. They can live for 2-3 weeks at room temperature, and for months when cooled to 50-60 degrees F.
ReptiWorms™ are perfect as an alternative to crickets, superworms, mealworms, and waxworms. Blaptica dubia roaches are also known as the Guyana spotted roach, orange spotted roach, and Argentine roach but are most commonly referred to as Dubia Roaches or simply Dubia. Dubia roaches bear live young that are approximately 1/8th inch when they are born. They can grow up to two inches in length and are used as feeders at all stages of life. Pet stores rarely carry these roaches and are commonly found online from independent breeders. Most people that use these roaches on a regular basis set up a simple and inexpensive breeding colony to supply their own needs due to the long term costs associated with feeding these insects. Dubia roaches cannot climb so they are ideal for home colony breeding. Dubia roaches have low chitin levels, high protein and low fat make them the idea feeder insects for your pet. Silkworms are more expensive and harder to find than other types of insects. Higher in calcium and lower in fat than other insects. Their soft exoskeleton makes them easy to digest. According to some hedgehog owners even picky hedgehogs tend to like them. Wild caught snails and slugs can carry lung worm or threadworm, which can be transmitted to your hedgehog and is fatal. Farm raised, canned, shelled snails are available in the reptile section of pet stores. Zoophobias or superworms look a lot like mealworms, but are more than twice the size and are much more aggressive than mealworms. Super worms have been known to bite hedgehogs both before the hedgehog has eaten them and after they are in the stomach cavity. Super worm attacks are often thought of as urban myths. However, a friend and fellow hedgehog breeder, Jeanne Stanoch of Prickly Hedgies, had a hedgehog that indeed died after eating super worms. According to Jeanne a few hours after eating super worms a female hedgehog started bleeding from the mouth and vomiting blood. After she died a necropsy was preformed and wounds were found on the inside of the hedgehog’s stomach which had been done by the super worms. Although the super worm was dead the head was still intact. We suggest feeding only dead super worms. An easy way to pre-kill the super worms is to simply put them in the freezer. Wax worms are the larval stage of the wax moth. They are more expensive and harder to find than other insects. Wax worms are high in fat and should be fed sparingly. Some hedgehog enthusiast find the roasted variety smells a lot like peanut butter and is heightens hedgehog’s interest in these bugs. Wax worms should be kept in the refrigerator and maintained on a high calcium insect food as bedding.